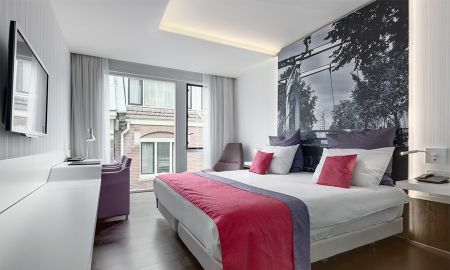 Built in 1855, the 5-star NH Collection Amsterdam Grand Hotel Krasnapolsky wears its steeped history proudly. Boasting 451 guestrooms, each one showcases a contemporary style, using a palette of warm, natural colours. Amidst the modern décor, find classic touches fused with well-equipped features like a walk-in rain shower. Replete with deluxe amenities and facilities, Wi-Fi internet connectivity is included as well as soft plush furnishings amidst an elegant environment and bright spaces. Selected accommodation benefit from picturesque canal views, parquet flooring and a private Jacuzzi, perfect to soak in after a long active day. Every morning, a hearty breakfast is served in the Winter Garden under the glass roof. Prepared fresh, the scrumptious buffet ensures a balanced, healthy start to the day and features a wide variety of fruit juices, pastries, cold cuts, cheeses, fruit, yogurt, breads and much more. The hotel’s exclusive dining experience includes the Michelin starred The White Room restaurant. In a beautiful 19th-century room, experience superlative cooking of sophisticated dishes and modern cuisine. Respecting the best ingredients on offer, the talented chefs use influences from all over the world to create a pure, honest, and pristine meal. Savour refined recipes that contain explosive flavours in a delightful culinary journey of discovery. The Grand Café Krasnapolsky is right place to enjoy a cup of coffee, snacks, lunch or dinner with an unrivalled view of the bustling Dam Square. As the day draws to a close, take advantage of the wide assortment of high quality wines, delicious cocktails, and tempting snacks on offer. 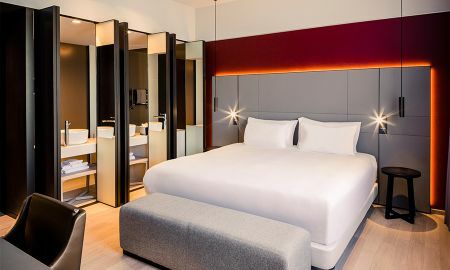 Situated on Amsterdam’s main square with views across to the Royal Palace, the NH Collection Amsterdam Grand Hotel Krasnapolsky is well-placed near the city’s finest shops. With a lot of must-see attractions just a short stroll away, the Anne Frank House and Van Gogh Museum are within a short walking distance. Amsterdam Airport Schiphol is 15 km from the property.